The Louisiana Division of the Arts is an agency within the Office of Cultural Development in the Louisiana Department of Culture, Recreation and Tourism. The Division of the Arts was created in 1977 to support established and individual artists and to stimulate public participation in the arts in Louisiana. The Division administers state and federal funds appropriated for arts grants in Louisiana through three principal mechanisms: the Statewide Arts Grants Program, the Louisiana Decentralized Arts Funding Program and Special Initiatives. The Division awards approximately $4 million in grants each year to Louisiana artists and non-profit organizations. Its programs encourage the expansion of audiences and stimulate public participation in the arts in Louisiana. The Louisiana Folklife Program is one of the programs of the Division of the Arts. The mandate of the Louisiana Folklife Program is to identify, document, preserve, and present Louisiana’s traditional cultures. Over the past 20 years, the Program has developed numerous projects and programs to implement this mandate. Its history can be highlighted by taking note of the accomplishments of the three individuals who have held the position of Director since 1979. The first director of the Program, Nicholas Spitzer (1979-1985) compiled the baseline research presented in Louisiana Folklife: A Guide to the State, assisted with four albums in the Louisiana Folklife Recording Series, had The Creole State: An Exhibition of Louisiana Folklife permanently installed in the State Capitol, and initiated the Louisiana Folklife Festival at the 1984 World’s Fair. He also started the statewide Louisiana Folklife Survey, which grew out of the Florida Parishes Folklife Project. The Florida Parishes Folklife Project, an ambitious seven-year project included a conference, survey, exhibit, festival, and publication. Robert Gates, the second director (1986-1988), expanded the Apprenticeship Program, initiated the Delta Parishes Survey (northeast Louisiana), and coordinated the folklife component of the 1988 Annual Made in the Shade Exhibit in conjunction with the Louisiana Crafts Council. He also moved the Louisiana Folklife Festival from Baton Rouge to Eunice in 1988 when the city of Baton Rouge was no longer able to support it. Maida Owens (Bergeron), the third and current director of the Louisiana Folklife Program, was appointed as the director in 1989. One of her first tasks was to determine a way for the Louisiana Folklife Festival to survive. Increasingly, the Louisiana Folklife Program was less involved in the festival. The Program started to initiate fieldwork to be presented at the festival and to provide technical assistance regarding programming and the interpretive booklet. The community then became responsible for producing the festival and hiring a folklorist to program it. After being held in New Orleans (1984), Baton Rouge (1985-87), Eunice (1988-89, 1991) and Kenner (1990), the City of Monroe now hosts the festival. While continuing the existing programs, Maida Owens (Bergeron) initiated several new ones--such as the Open House Storytelling Program. This resulted in the publication of a book Swapping Stories: Folktales from Louisiana (1997) over which Owens was co-editor. Maida Owens also served as co-producer/researcher of the book companion video program (1997). The Louisiana Folklife Survey became an ongoing project to document traditional artists and communities with special focus on regions not previously documented. A map, Louisiana Folk Regions, showing the major subregions and ethnic groups in Louisiana was compiled by Maida Owens based on Spitzer, Kniffen, Knipmeyer, Newton, Gregory, and Roach, with cartography by Greg Wirth. The Louisiana Folklife Recording Series developed into a program that documents traditional musicians and storytellers otherwise unlikely to be recorded by commercial labels such as African-American work songs, old time Cajun and country music. Maida Owens was a curator for the renovation of The Creole State: An Exhibition of Louisiana Folklife (1995) permanently located in the State Capitol, edited the publication Fait a la Main: A Sourcebook of Louisiana Crafts (1988), co-edited Keeping It Alive: Cultural Conservation Through Apprenticeship, A Review of the Louisiana Apprenticeship Program (1993). She also served as assistant producer and researcher for the video documentary Dance for a Chicken: The Cajun Mardi Gras (1993). 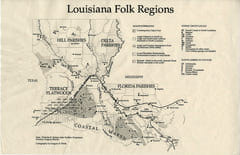 Louisiana Folklife Program Project Files, Louisiana and Lower Mississippi Valley Collections, LSU Libraries, Baton Rouge, Louisiana.